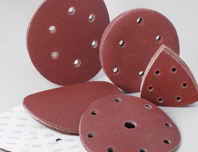 By using different bonds to adhere abrasives on a flexible substrate (cloth or paper), Coated abrasives with different material compositions have sheet-like (rectangular), discs, annular and other special shapes, and the main varieties of abrasive cloth (paper) and abrasive belt. They are used in mechanical or manual operation that widely in grinding, sanding and polishing metal materials, wood, ceramic, plastic, leather, rubber, paint putty and other non-metallic materials. Why to Use Flap Discs to Sanding the Molding?